Step up to the EZM 5 Professional Series with the Sinn U2. 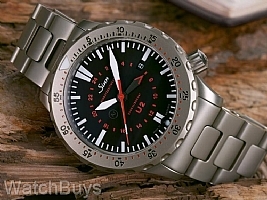 The technology and design elements used to create the Sinn U2 go far beyond standards used at most watch companies. The Sinn U2 case is made from the same German steel that is also used in the construction of the outer hull of submarines. The steel was procured by Sinn from a steel supplier to Emden GmbH, one of Germanys North Sea shipbuilding yards who construct submarines from the very same steel. The uni-directional ratchet operated rotating bezel is also milled from this submarine steel which is Tegimented. The indices are machined directly into the bezel without the use of bezel inserts, which can corrode or come loose at deep depths. The international testing lab of Germanischen Lloyd has tested the U2, and determined that the watch can be certified as water resistant to 2,000 meters. This same firm tests submarines for their ability to withstand the effects of underwater use. The Sinn U2 has full UTC functionality through the use of an additional short red tipped hour hand which can be set independently from the primary time zone and indicates the second time zone using a 24 hour display. Screw down crown. The U2 features an inert gas filled cavity with two copper sulphate humidity absorbing capsules, which are visible at 6. Other features include sapphire crystal with hardened anti-reflective coating, and stainless steel bracelet. Verified Owner Comments: I love the U2 and am very pleased with my purchase. It's my 2nd Sinn watch as I also own an 856 UTC. It's well machined, is very accurate (within COSC specs), and it looks great. As a professional outdoor landscape photographer in the mountains, my work watches are regularly exposed to water, rather extreme temperature changes, altitude changes on a regular basis, physical abuse and more, and this watch appears to be built to take it all without a hiccup. The 4-o'clock crown is a big plus and helps tremendously with comfort, a feature I wish more watches had. Overall I am thrilled with it, it's definitely a keeper! Verified Owner Comments: Just a lovely watch - as long as my wife doesn't ask me too much. And I'd like to buy another Sinn when I can afford it! Verified Owner Comments: One of the best divers made. The dial is very legible and has the tegimented technology on the bezel, which is the most scratch prone part of the case. Verified Owner Comments: Just got my new Sinn. really nice and solid. German engineering all the way. Originally bought the U1 but then decided on the U2 EZM 5. Liked the look better and the two time zones is a big plus for me. Purchased the rubber strap and changed out the bands as soon as I got it. Wanted the rubber strap model but did not want to wait a month to get it. The black strap really makes the face and body look great. Verified Owner Comments: I've owned this watch a little over a year. It's easliy one of my favorite 1 or 2 watches. Bulletproof case, extemely accurate time keeping. The sword hands are very elegant on such a robust and well built watch. The heft of the watch is very pleasing. I've been able to read the lume as late as 5-6 a.m. in the morning. This is a classic dive watch. "U2 - Some kind of Watch"
Have had my new U2 for exactly one week. Have had plenty of high quality mechanical watches, but this one is the most accurate...has lost 3/4th of a second in one week! Looks terrific too. Unfortunately, the bracelet is not up to the same quality as the watch itself, but overall, it's terrific. "U2 is a great value"
Verified Owner Comments: I own a Sinn U2 and I can't praise it enough. The watch is as rugged as can be. It is almost two years old and looks as if it just came out of the box brand new. I have never seen a more robust, scratch-resistant timepiece. It's hefty but very well-balanced, and extremely attractive in appearance. In contrast to the watch itself, the bracelet does seems to be a bit susceptible to minor scratching, but no more so than any other bracelet I've seen. Indeed, there is a "fine tuning" provision to adjust the length of the bracelet. It's in the form of three small springbar holes on one portion of the deployant clasp. The U2 has convinced me that Sinn watches are among the very best values in fine timepieces available today. I HIGHLY recommend this watch! It's fantastic. This is probably the highest tech dive watch on the market today. Very elite. The watch is rather heavy, but is balanced very well, so the weight is not noticeable. The U2 is the most accurate mechanical watch I own. It has averaged about -1 to -2 secs a day. The only complaint I have is with the bracelet. It does not have a very wide range of fine tuning adjustment (there are no "half" links), and is rather easily scratched. A more scratch resistant finish on the bracelet would be a big improvement. All in all, I am satisfied with this purchase, and plan on buying another Sinn in the very near future.